A narrow lane just off High Street, at the junction with The Loan, Queensferry, is indicated by a street sign and nothing more. 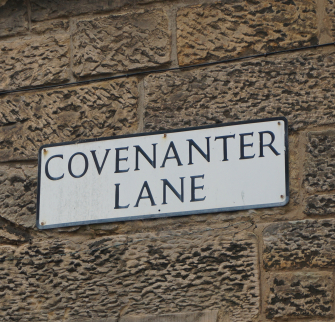 A narrow lane at the west end of Queensferry's High Street is known as Covenanter Lane. 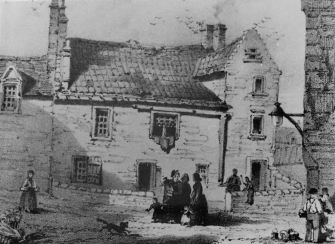 This was named after the old house which stood there (now demolished - shown to left) where Rev Donald Cargill and Henry Hall of Haughhead were caught by the soldiers from Blackness Castle on 3 June 1680. The captain of the castle, Middleton, and his men, met the pair at a hostelry in the burgh, and tricked them into joining them in a glass of wine. When they tried to arrest them, Hall withdrew his sword but was shot by the waiter, George. Cargill was wounded but escaped on Middleton's horse. Hall was caught but died before he reached Canongate Tolbooth in Edinburgh. On his possession was the 'Queensferry Paper' or 'Queensferry Covenant', later to be used in evidence against Cargill. It was one of the first times that the more radical Covenanters had denounced the king. The lane is also said to be named after the Covenanters who used to hide in the cellars of the old houses heareabouts, awaiting boats to take them to safety in Holland.